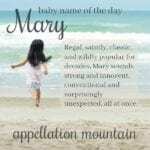 It’s a Marian name boosted by pop culture. Let’s talk about one of 2014’s Top 1000 debuts. Our Baby Name of the Day is Aranza. 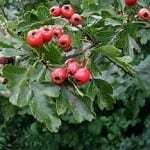 Legend has it that a humble shepherd discovered a statue of the Virgin Mary in a hawthorn bush back in the Year of our Lord 1468. The shepherd was speaking Basque, a language currently spoken by more than half a million native speakers. It’s a language isolate – in other words, Basque is only like Basque. It’s not a cousin to Spanish or Russian or even Estonian. Back in the fifteenth century, there was nothing so shocking about a Basque speaking Basque. But the language was repressed over the centuries, and has experienced a rebirth in recent decades. And so there’s an interest in heritage names, including the much-loved, and Basque in origin, Xavier. As for Arantzazu, it’s been a pilgrimage site since the fifteenth century, with a new basilica constructed in 1950. 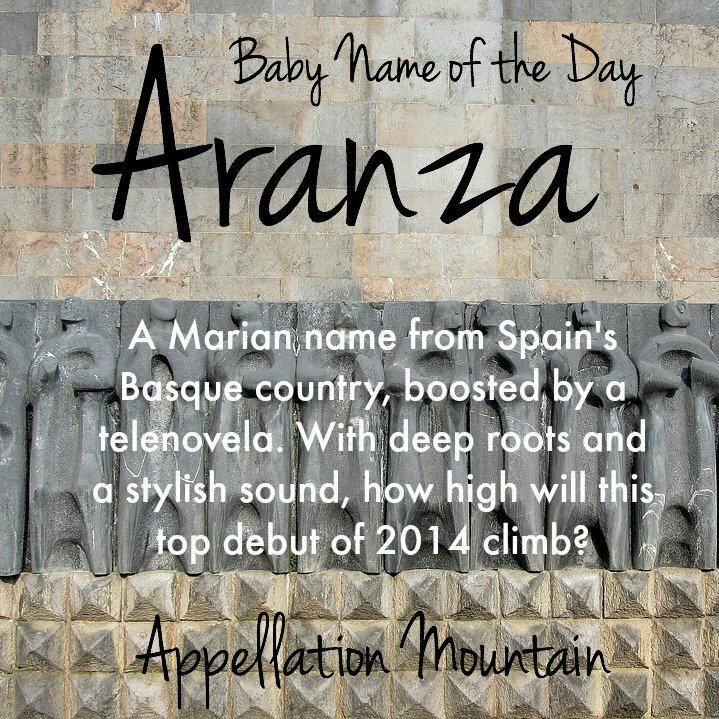 Like many a place name associated with Mary, Arantzazu has seen some use as a given name, too. Arantza, Arancha, Arantxa, and, yes, Aranza are all given names evolved from Arantzazu. They might have remained obscure for ages, except that pop culture has boosted the name, especially Aranza. Mexican singer Aranza. A member of a successful pop group while still a teenager, she’s had a solo career that’s included recording telenovela theme songs. Speaking of telenovelas, young Thelma Madrigal wears this name on Por siempre mi amor – Forever Yours. She’s the daughter of the main characters, and like any soap, heartache and drama abound. The show was a huge hit in 2014, and is credited with boosting Aranza into the Top 1000. I’ve also found a handful of references to Aranza as a clothing brand – there’s a line of shape wear, as well as a small designer featured at Mexico’s Intermoda shows in 2010 and 2011. The name is not unknown elsewhere in the Spanish-speaking world, but Aranza was rare in the US until recently. There were a few dozen girls given the name most years from the 1990s onwards. But in 2014? 473 newborns – more than ten times as many as in the year before, propelling Aranza into the US Top 1000 for the first time ever at #607. Names that come out of nowhere and rise quickly sometimes have equally spectacular falls. I’m looking at you, Miley. 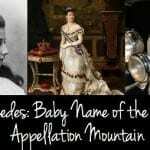 This name has roots that trace back over hundreds of years, and the connection to Mary puts Aranza in the company of Guadalupe, Lourdes, and Carmel. We’ve embraced similar sounding names in recent years. The current US Top 100 includes Aria, Ariana, and Arianna. And the -za ending brings to mind Eliza. There’s a real need for crossover names that work well in English and Spanish. Names like Sophia/Sofia and Isabella are obvious examples, but even names without Spanish roots that just happen to sound great in Spanish – think Mia – have fared well. All of this makes Aranza a rarity on the rise – and for good reasons. What do you think of Aranza? Will this name keep climbing? The universe is a mysterious place! And while my knowledge of tennis is woefully lacking, I feel like I need to catch up on the sport – if only for the amazing names of the athletes! Tennis player Arantxa Sanchez-Vicario was also the first Aranzazu I ever heard of. 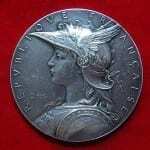 Her birth name is Aranzazu Isabel Maria (three names – love!). I see it rising but not to Top 100. Thank you, Christina – can’t believe I forgot her! I think I’m older than you but my first association with this name is Arantxa Sanchez-Vicario, who was a prominent tennis player in the early 1990s. I’m assuming Arantxa and Aranza are variants of the same name and pronounced similarly. I have a friend named Aranzazu (she goes by Aranza most of the time) and thought it was so unusual, so it was a surprise to see it being discussed as a fast-rising name in 2014. I like it. I’m down for anything with a Z.
I love it. 🙂 I can’t really see it rising into the top 100, but between the character that started the trend and all the attention the name’s been given in the wake of the 2014 stats, I do think we’ll see more of it.